Is the new baby a girl or a boy? This stork tells the story. Simply cut the project from 1/2" plywood and paint. Sign reverses to say, It’s a Boy or It’s a Girl. 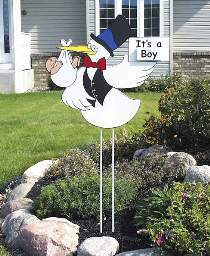 Requires one It’s a Boy/Girl decal and one yard ornament mounting kit, which includes two 36" long fiberglass rods for the stork’s legs, as well as clamps and mounting screws. Stork body measures 25"W.